Is it possible to pass category ID as url parameter? 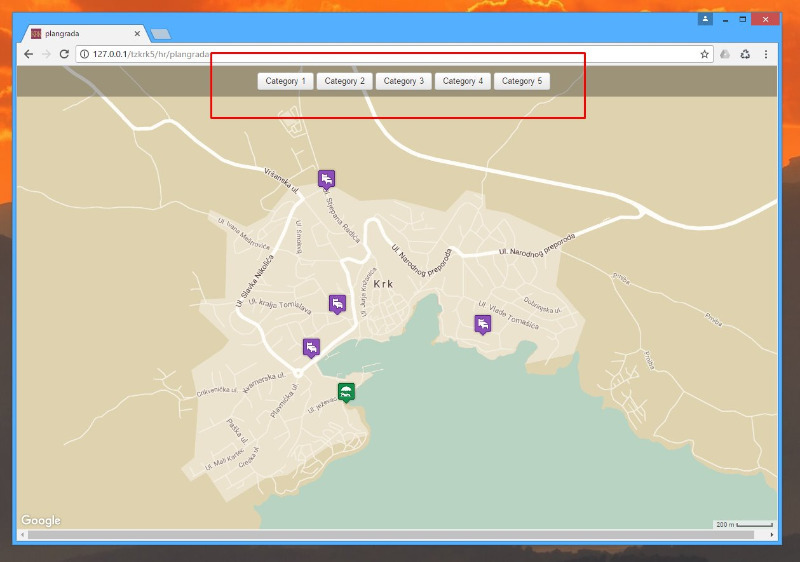 I need to create several clickable buttons, when clicked to open or refresh map and show only items from clicked category? Also one button to reset category. It's doable with creating many Joomla menu items but I'd like to avoid that. Réponse de gmapfp sur le sujet Pass category id with url parameter? Réponse de Krx sur le sujet Pass category id with url parameter? I need it to look like what I attached in this post. 10-15 buttons, one for each category and one button for reset things. - I don't need it to work and look like what's shown in these two demos. and Gmap DropDown Menus for Category and City doesn't work. because of some security purposes. So I need to have plain and simple buttons with onclick="this.form.submit();" on them. I asked here to save me some time until I figure out proper value to send via it.